In 1942, a Polish prostitute is murdered in Warsaw. 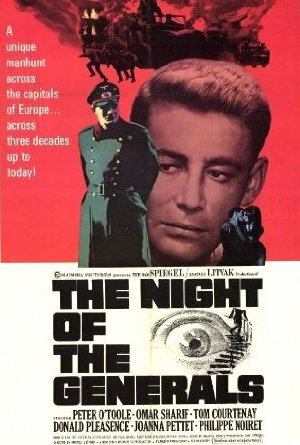 Suspicion falls on three generals, and Major Grau of German Intelligence seeks justice despite the ongoing atrocities committed during WWII. NYTimes: Obviously the aim of this pictures, like the novel by Hans Helmut Kirst from which Joseph Kessel and Paul Dehn have derived their script, is to point up the shadow of difference between murder as an individual act and mass killing as a relentless and accepted practice in war. It is to provide some commentary on the nature of the Nazis' wartime crimes, and reflect, perhaps, on the justice meted out of their leaders for their deeds. To a certain extent, these large intentions do begin to coagulate as ironic implications as the picture goes along, gathering together a scattered story. It is that of a young intelligence major's attempts to discover who of three generals in Warsaw in 1942 was responsible for the sadistic murder of a prostitute.